antana camara ‘Confetti’ is a shrub-type Lantana that can get 2-3′ in height with a 6-8′ spread. The blooms are tri-colored consisting of yellow, pink, and purple to wine colors that will fade with age and are great for attracting butterflies. Confettii Lantana will bloom late spring to fall and has an upright growth habit. The foliage is very aromatic and can irritate the skin of some people. 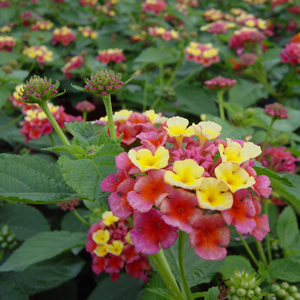 Confetti Lantana should be spaced every 24-36″ when planting.